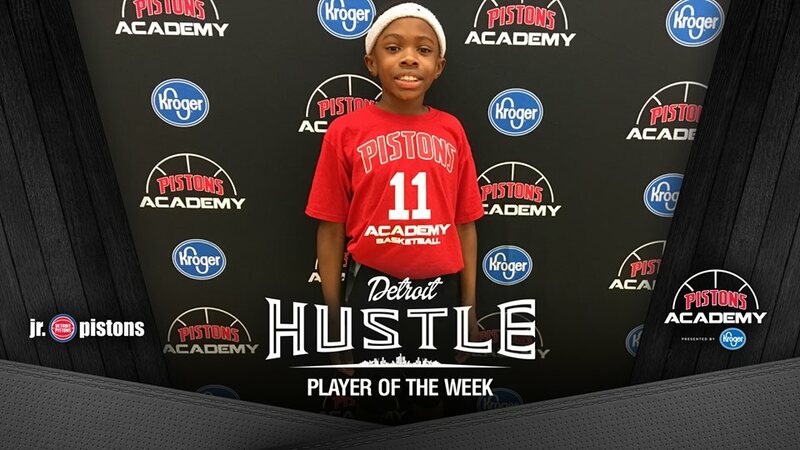 Congratulations to Quran Creary (College Division – Hoosiers) on being named this week’s “Detroit Hustle Player of the Week” for his stellar play on Saturday. Although his team lost a close game, Quran played with great poise and determination. SPURS 33, PISTONS 31: In the season opener for both teams, Jack Genzlinger (11 points) and Max Kramer (10 points) combined for 21 of their team’s 33 points, leading the Spurs (1-0) to victory. Ari Ferber scored 11 points while Jake Spencer, Christian Hosler, Brandon Counts, and Haadi Rizvi each added 5 points for the Pistons. FALCONS 19, RAIDERS 12: The Falcons (2-0) continued their winning ways as they used a 13-4 advantage at halftime to cruise to another victory. The duo of Luca Spadafore (8 points) and Zackary Kozouz (7 points) paced the Falcons. Devin Young scored 6 for the Raiders, who will look to bounce back next week. KNIGHTS 25, RAVENS 23: A small halftime deficit (13-16) proved to be no issue as the Knights (1-0) rallied for the slim margin of victory in this compelling Prep Division showdown. The Ravens (0-2) dropped their second-consecutive close game, but look poised to break through any game now. Jamir Eans scored 9 points and Sam Thomas and CJ Brown each added 6 points for the Ravens. The Knights were led by Lance Kukes (11 points) and Tyler Robinson (10 points). HUSKIES 35, WOLVERINES 16: 12 points from Chase Kukes and 6 points from Benjamin Schwartz (2 trifectas) were all the Huskies (2-0) needed to outpace the Wolverines, who dropped to 1-1 on the season. Tommy O’Doherty played well for the Wolverines, scoring 4 points and grabbing 3 rebounds. Daniel Cockroft also scored 4 for the Wolverines, who are still considered one of the favorites in College Division. SPARTANS 39, HOOSIERS 29: The Spartans found their offensive rhythm on Saturday, exploding for 39 points and picking up their first win. Landon McKinney scored 12 to go along with Nick Batey’s 9 points and Connor Cotant’s 8 points. The Hoosiers (0-2) battled back in the second half behind Aidan French (8 points) and Quran Creary (8 points, 3 assists) but it wasn’t enough to take down the Spartans, who improved to 1-1 on the season. HOYAS 27, BRONCOS 23 (OT): In this overtime thriller, Eli Yen scored 4 huge points in overtime to push his Hoyas team to victory. Yen scored a game-high 16 points to go along with Vagelis Tzoumakas’ 4 points and 5 rebounds, pushing the Hoyas to 1-1 on the season. Tejas Sabnis led the Broncos (0-2) with 6 points, who have lost two close games by a combined 8 points. They will look to get over the hump in next weekend’s 3rd game. WILDCATS 30, CHIPPEWAS 11: The Wildcats (2-0) used a 2nd half outburst to take down the Chippewas (0-2) in a game that was much closer than the final score would indicate. Trailing by 4 at the half (6-10), the Wildcats used stifling defense to outscore the Chippewas by a score of 24-1 in the 2nd half. Chase Chaldecott scored a game-high 17 points and Sam Loughlin chipped in 5 points and 2 steals for the Wildcats. Henry Weiss led the Chippewas with 7 points on a day where it felt like their was a lid on the basket for their entire team. Despite the shooting woes in the second half, the Chippewas deserve credit for hanging in there and fighting until the end. They will look to get back on track next week. BULLS 28, BLAZERS 12: Luke Thurswell (8 points) and Luke Salkowski (7 points) were a force around the basket for the Bulls (1-1) as they dominated the paint in the second half. Offensive rebounds and second chance points led the Bulls to a 17-4 advantage in the second half. The Blazers (0-2) have yet to find a rhythm on offense but have showed signs that they can be a dangerous team. Santino Ruma scored 5 and Braeden Logsdon added 5 points and 3 steals for the Blazers. SONICS 53, SPIRITS 31: The twin towers, Noah Kam (17 points) and Carson Brodsky (16 points), made the most of their opportunities as they combined for 33 of the Sonics (2-0) 53 points. The Sonics’ pick-and-roll offense led to many easy buckets around the basket as the shorthanded Spirits had trouble defending the rim. Without some of their front-court players, the Spirits (0-2) dropped a 2nd consecutive game. Blaine Proefke (10 points) and Jack Fundukian (9 points) led the Spirits, who will look to regroup and bounce back. WARRIORS 33, SPURS 28: The Warriors (2-0) won their second game in as many weeks as they stormed back against the Spurs (1-1). Trailing 17-13 at the break, the Warriors outscored their opponents 20-11 in the 2nd half to claim victory. Ben Rosenfield (10 points, 7 rebounds) and Abe Miller (9 points) paced the Warriors while Grant Supanich led the Spurs with 6 points. CELTICS 41, PISTONS 21: Ben Diskin scored a game-high 13 points and Xavier Lane added 11 points for the Celtics (2-0), as they remain in 1st place in the Pro Division. The Pistons, coming off a close defeat in Friday night’s action, hung tough for a while before eventually falling behind. Ari Ferber scored 6 points to lead the Pistons (0-2). TROPICS 38, BULLETS 37: In a thrilling Legends Division match up, these two veteran teams went toe-for-toe for 36 minutes. In the end, it was Bryan Thomas (12 points) and the Tropics (2-0) who came out victorious. Dylan Dembs scored a game-high 18 points for the Bullets (0-2). Dylan Genzlinger added 8 points for the Tropics as they prepare for a Legends Division showdown next week. « Pistons Academy 3-on-3 Tournament Returns!